Ocean Casino Resort’s previous owner, Bruce Deifik, died in a single-car crash in Colorado on April 8th. Ocean Resort Casino changed its name for the third time in its 7-year history, but local gamblers might not notice the change. The new name is “Ocean Casino Resort”, which is a slight alteration from the previous one. Eric Matejevich, named the divestiture trustee in February, said the new approach involves running the business like a casino — not a resort. In Atlantic City jargon, that means the operation will stop trying to be a Las Vegas-style integrated casino resort. Instead, Ocean Casino Resort plans to offer comps and other promotions to lure gamblers to the place. Therefore, the change from “Resort Casino” to “Casino Resort” is important — the casino comes first. For years, Atlantic City gamblers have complained the former Revel Casino never offered competitives casino comps. Perhaps that changes now. The Ocean Casino Resorts’ ownership claims it has received the message. A certain amount of pomposity continues in the ad copy, though. According to the Ocean Casino Resorts Twitter page, the resort’s latest incarnation hopes to attract customers through a combination of “approachability”, “elegance”, and a “constant movement to the future”. “Constant movement to the future” might mean the new owners will embrace innovation, mobile gambling, eSports, and skill gaming. Or it might be pretentious marketing terminology. Whatever the case, Ocean Casino Resort got the message to a certain degree. The casino had its grand opening in April 2012 as Revel Casino. Revel Entertainment faced two bankruptcies in 29 months and closed the casino in September 2014 after the second bankruptcy. One reason for both bankruptcies was the exorbitant cost Revel had to pay for electricity. 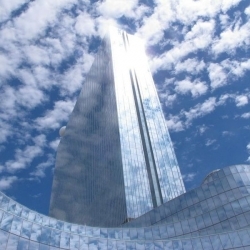 ACR Energy Partners charged Revel Casino $3 million a month for electricity. Brookfield Asset Management, the Toronto-based casino holding company that won the bankruptcy auction to buy Revel Casino, balked at ACR Energy Partners’ price. When Brookfield could not renegotiate the electricity bill with ACR Energy, it pulled out of the auction (and forfeited a $10 million deposit). Glenn Straub bought the property in the spring of 2015. In May 2016, he renamed the build TEN Casino. Readers might not remember that name, because Straub never opened the casino operation. Like Revel Entertainment and Brookfield Asset Management, Glenn Straub had problems renegotiating the energy costs from ACR Energy. Glenn Straub had an inventive new strategy, though — don’t open the casino and don’t pay the energy costs. For months after he bought the casino, ACR Energy Partners urged Straub to open the casino. Instead, the two became embroiled in a months-long lawsuit. When ACR Energy Partners complained the Revel Casino was falling into disrepair because Straub wouldn’t turn on the electricity, he claimed broken windows were the result of seagulls. After six months of inactivity, ACR Energy admitted it was going bankrupt without the monthly payments. Eventually, Glenn Straub solved the problem by buying out ACR Energy for $30 million. Glenn Strabe sold the casino to the late Bruce Deifik in early 2018. Deifik changed the name to Ocean Resort Casino and opened for business in June 2018. After six months, the Colorado developer owned millions to creditors and agreed to a sale. Deifik sold in part because of a lawsuit by creditors. It isn’t the only one. A former partner and nightclub manager at the Ocean Resort Casino sued for $10 million. The suit’s filings told a bizarre tale that invoked the #MeToo movement. That lawsuit continues, though Luxor Capital, a New York hedge fund and the new owners, are turning the page. The new ownership rebranded a third time, this time to Ocean Casino Resort. Frequent name changes are a sign of trouble for a business. It should come as no suprise that Ocean Casino Resort faces significant headwinds in the Atlantic City casino market. The former Revel Building is an architectural wonder, the largest building in the city. Nevertheless, the opulent building looks like it should be on the Las Vegas Strip — not the Boardwalk. Visitors say its grand nature hurts it, because it isn’t easy to find the casino. The hotel rooms are too small. Residents even complain it is badly positioned to attract Atlantic City customers.